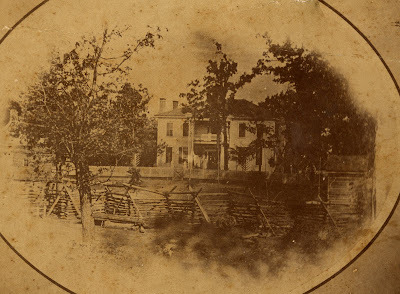 First, from Mary Alnutt, who lives nearby, came information on the house's demise and this photo (near the house's location but uncertainly connected to it). The Hall was destroyed by fire sometime in the late 1800s according to Loula Kendall Rogers, daughter of the physician who built Bellwood, who wrote in a volume of poetry she published: "Just at the close of our fall term at Gordon Institute, as twilight shades enshrouded the earth, there came the sad tidings that Bellwood, the beautiful home of my childhood, was destroyed by fire." Mary let me know that the little house in front of Bellwood, which I speculated may have been slave quarters, was actually Dr. Kendall's medical office. 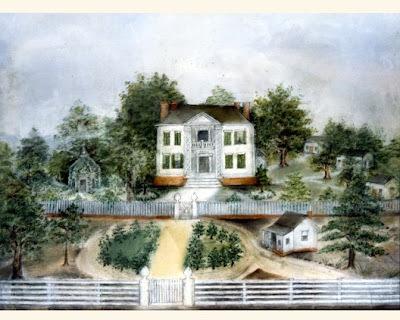 David Paterson sent this 1858 photograph of the house, which as he noted, is in contrast to the idealized portrait at the top of the post, and which was also painted by Loula of her beloved home. 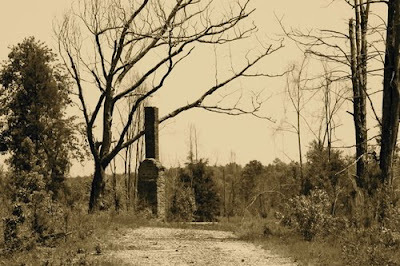 It is inscribed on the back: ""Bellwood Upson Co. Ga. The old Kendall Home. A true type of the old Southern Plantation house. The fence was only put up until a new one was built, and the carriage drive improved, like the pastel picture." [added underneath in the shakier handwriting of old age:] "This Picture was taken when I was a child. Loula Kendall. 1850." Mary Nowell, who recently presented extensive research on Loula Kendall Rogers to the Upson County Historical Society, also got in touch with Bellwood's part in the Civil War: "Wilson’s Raiders came to...the Kendall home, Bellwood Hall, for 3 days. Loula was there along with her mother, Louisa and grandmother, Winifred Lane Rogers. They hid their supplies, horses and mules. The raiders found it all and they took it all. One of the raiders pointed a pistol at Loula’s chest and demanded even more." Loula gave him her jewelry, but asked that they preserve the Hall, where she remembered her childhood as 'one long summertime'. It survived the war, as did Loula's legacy: 21,000 items of family and local history are now in the Special Collections Department at Emory University. I'm a Georgia native, and sent the photo of the "Christmas tree" structures around to an architectural historian and a Georgia gardening expert here. Neither is certain, but both feel they must be trellises of some sort. I also searched the book Architecture of Middle Georgia without finding anything similar. If you look closely at Loula's pastel, you can clearly see a little diamond-shape bush at the fence, corresponding to the one on the right, and the point of another on the left. Though the scale is wrong, I think there's definitely a geometric plant there in the artist's memory. Wonderful that your post stimulates our imagination so much. I've always wondered about little houses planted on the lane before the house. They seemed to be common at one time. A medical office! Of couse. I am not from the American South, but I think there is a simple explanation in the note on the back: "The fence was only put up until a new one was built." The zig-zag structure is "the fence". It looks very stable and is soundly constructed of local materials -- good for keeping animals out. The "new one" is the neat, fashionable and probably very expensive picket fence. Hum. On second thoughts, the "new one" is the outer post-and-rail fence, which is (like the picket fence) built of sawn timber rather than the rough-hewn materials of early settlers. A sign of prosperity, IOW. What a great post... love the pic.'s! I too am a native Georgian and I'd say those two Christmas tree formations near the house were possibly bottle trees...Check those out. I think there was a superstition related to them, but haven't researched it. However, they certainly look like the structures I see in a few modern day yards where old Southern things are being reconstructed.